That’s the number of books in which stories I have written appear. It’s also the number of bookstores I’ve been in within the last two days. And this should come as no surprise – it’s also the number of physical books I’ve purchased in those two trips. Last night I went to Carmichael’s, Louisville’s independent bookseller. They’ve been around for thirty years, and they used to be the place to buy magazines like The Sun and books you couldn’t find anywhere else. For example, the book I wanted to throw at Greg Herren was purchased at Carmichael’s. 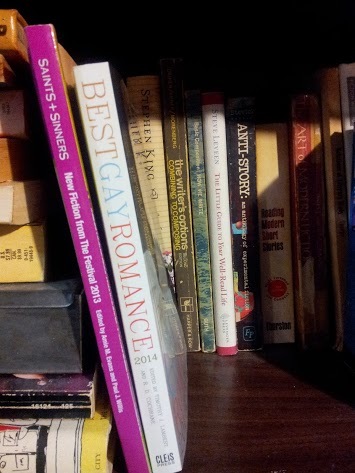 I went there stalking Best Gay Romance 2014. I wanted to see it in its natural habitat, which I did. I took a picture and posted it here, and then I bought it. What can I say? It’s been a dream of mine since I was in, what, the sixth grade? Earlier? I never could find the first book my work is in – Saints & Sinners 2013: New Fiction from the Festival – in an actual physical bookstore. But then again it was the first book with something I wrote in it. That was thrill enough. Almost. I wandered around finding interesting books at every turn, and frankly, getting overwhelmed. If money, space and time were no objects, I would have left with about forty titles. But they are objects, space most of all. So I made mental notes of things to look for in digital format, and then I did what I always do in big bookstores where one is likely to be able to find books by people one especially likes. I looked for Poppy Z. Brite, Tananarive Due, Keith Snyder. I found only the first before stumbling upon two books of a series that looked oddly reminiscent of that Tor young adult series I was recalling recently here. One of the books had Voodoo in the title and the other dealt with the Tarot. (From the covers they did not, however, strike me as either subtle or sophisticated, the way Steve Berman’s “Beach 2” did.) I did some more mental note taking. As I was turning away, the spine of another book caught my eye. It said Death Trick. I laughed. After all, this wasn’t the back of the store; this wasn’t an inch from the floor. This was on eye level, in Mysteries. This couldn’t be intended to mean that sort of trick. What a waste of a title, I thought, picking it off the shelf and flipping it over. I found a mirror ball, a rainbow, and a subtitle: “A Donald Strachey Mystery.” I’d heard of them, but never picked one up. This is the first and, according to the Author’s note, the only pre-AIDS written entry in the series. It didn’t look like a title I would find in ebook form, so I bought it. Come to find out it is available that way, but there’s some criticism of the quality of the digital formatting. Two bookstores. Two books. Two days. And speaking of twos, tonight’s review is of the second story in Best Gay Romance 2014. Let’s get to it. There’s nothing more thrilling than seeing something I’ve written on a shelf in a store. And knowing that no one around me has any idea it’s mine! There’s always something to humble me though, and it’s not just the zillions of books around it and the fear no one will ever notice mine. Example: the time I found one of the first TJB books, personally inscribed to a friend, on the shelf at Half Price Books. So I say take any moments of pride and happiness as a writer where you can find them.